Magic Hat Art Hop Ale 2016 is coming this summer. The beer is a collaboration; an intersection of art and brewing. The brewery teamed up with the non-profit SEABA (South End Arts and Business), which promotes local artists as well as businesses. The Labels for Libations contest motivated Vermont artists to submit works for the can. The winning label was crated by Zelde Grimm. Magic Hat Art Hop Ale 2016 is an imperial blonde ale, brewed with blood orange, orange peel, and sage. A bready malt body creates a solid canvas for blood orange, while sage provides the balancing juxtaposition of spice to the citrus notes from Simcoe, Amarillo and Cascade hops. Magic Hat Art Hop Ale 2016 is available all summer in 16 ounce cans and draft. Availability: 16oz Cans, Draft. Summer seasonal. Magic Hat Mother Lager looks to be making a return to the brewery’s lineup. First released back in 2003, we estimate it was retired around 2007-2008. Magic Hat Mother Lager is a euro pale lager meant to refresh, but is quite easy to drink. Magic Hat Mother Lager is a 12 ounce bottle offering. The return has not yet been announced. Looks like 16oz cans are the new way to go. Bell’s Brewery, SweetWater, Oskar Blues – all tallboys. Magic Hat (South Burlington, VT) has now launched #9 in 16oz cans alongside the 12oz can offerings. Magic Hat Brewing is working up a fall offering, Wilhelm Scream Pumpkin Ale. The name “Wilhelm Scream” refers to a Hollywood sound effect that has been used in more than 200 movies over the last 70 years. (Including Star Wars.) Watch the compilation below, you’ll know it. Due to be packaged in 12oz bottles and draft. Valentine’s Day will bring the launch of a new beer to Vermont based Magic Hat. Check out the teaser trailer above. This nearly 6 minute video from Magic Hat (Burlington, VT) will take you through the entire brewing process. You know, if you’re interested in that sort of thing. Ain’t Nuttin’ But a Magic Hat G-Thing! I’m sure the song is already in your head. 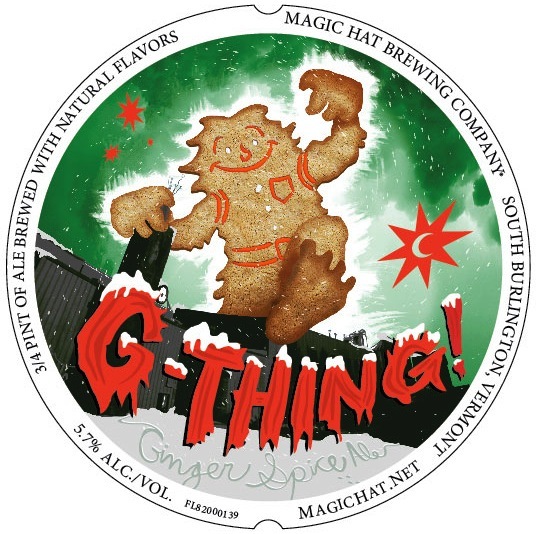 Meet Magic Hat G-Thing!, a spicy winter beer from the Vermont based brewery. Subtitled “Ginger Spice Ale” the gingerbread man is a dead give away. Release details forthcoming, but you can pretty much imagine late Fall, 2013.